It’s one of the first things you see when you walk through our doors – a notice declaring EQ3 products are Mostly Made in Canada. It also describes EQ3’s business sense and sensibility. EQ3 is proudly Canadian. We’re proud of our roots and strive to design and produce as much of our product in Canada as possible. Currently, all of our upholstery pieces are made in our Winnipeg-based factory. 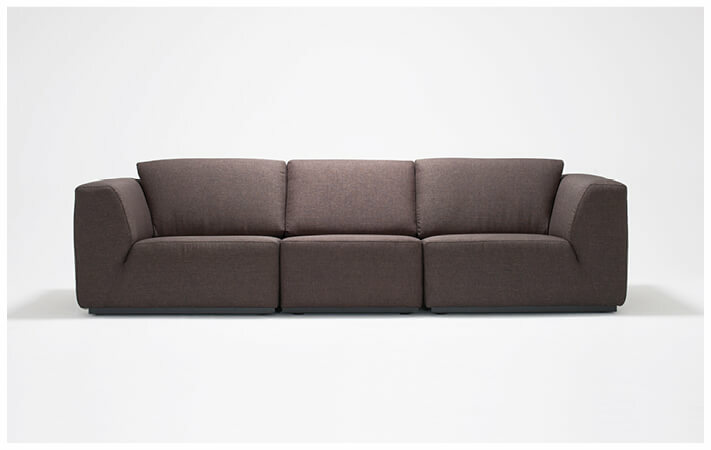 This includes all sofas, sectionals, throw cushions, ottomans and more. At EQ3, we’re always looking for new ways to think local and manufacture our modern designs in Canada. The more accessible the product is to us during development, the more hands on we can be, ensuring a better product for you. It also means you’ll be arranging and fluffing in no time. When you order a custom made sofa from EQ3, you can count on your new piece arriving home in approximately 8 to 12 weeks. Although it’s ideal, manufacturing in Canada isn’t always possible. In some cases, materials are not as readily available here as they are overseas. Currently, about 30% of our product, including items like dining tables and office storage, is manufactured in our EQ3-owned factory in Indonesia. Our rug program is also rooted overseas and hand woven by the talented artisans of India. Whether it’s made here at home, or developed overseas, EQ3 always ensures quality craftsmanship with every product we produce. For modern furniture and accents from here at home and around the globe, we invite you to choose EQ3 for your space.